by Limmer, Daniel J., EMT-P; O'Keefe, Michael F.
MyBRADYLab is an online homework, tutorial, and assessment program designed to work with this text to engage students and improve results. Within its structured environment, students practice what they learn, test their understanding, and pursue a personalized study plan that helps them better absorb course material and understand difficult concepts. Daniel Limmer (Author). Dan Limmer, EMT-P, has been involved in EMS for over 25 years. He remains active as a paramedic with Kennebunk Fire Rescue in Kennebunk, Maine, and the Kennebunkport EMS (KEMS) in Kennebunkport, Maine. A passionate educator, Dan teaches EMT and paramedic courses at the Southern Maine Community College in South Portland, Maine, and has taught at the George Washington University in Washington, DC and the Hudson Valley Community College in Troy, New York. He is a charter member of the National Association of EMS Educators and a member of the National Association of EMTs (NAEMT) for which he serves on the Advanced Medical Life Support Committee. Dan was formerly involved in law enforcement, beginning as a dispatcher and retiring as a police officer in Colonie, New York, where he received three command recognition awards as well as the distinguished service award (Officer of the Year) in 1987. During his 20-year law enforcement career he served in the communications, patrol, juvenile, narcotics, and training units. 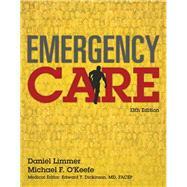 In addition to authoring several EMS journal articles, Dan is co-author of a number of EMS textbooks for Brady including First Responder: A Skills Approach, Essentials of Emergency Care, Advanced Medical Life Support, the military and fire service editions of Emergency Care, and others. He speaks frequently at regional, state, and national EMS conferences. Michael F. O'Keefe (Author). Mike O'Keefe, MS, EMT-P, became the Vermont EMS State Training Coordinator in 1989. He has a Master's degree in biostatistics and was an EMT-Intermediate for 16 years before becoming a paramedic 10 years ago. Mike was chosen to participate in the development of all four U.S. Department of Tranpsortation National Standard EMS Curricula (for First Responders, EMT-Basics, EMT-Intermediates, and EMT-Paramedics). He was also on the steering committee that developed the Geriatric Education for Emergency Medical Services (GEMS) course for the American Geriatrics Society and coauthored a chapter of the textbook for that course. Mike is co-author of the Brady text Essentials of Emergency Care and is a contributing writer to the Brady text Paramedic Care: Principles & Practice. He is very interested in promoting EMS research, particularly in rural areas. Mike is active as a volunteer EMS provider in northwestern Vermont and is a speaker at EMS conferences. Edward T. Dickinson (Medical Editor). Edward T. Dickinson, MD, NREMT-P, FACEP, is currently Assistant Professor and Director of EMS Field Operations in the Department of Emergency Medicine of the University of Pennsylvania School of Medicine in Philadelphia. He is Medical Director of the Malvern Fire Company, the Berwyn Fire Company, and the Township of Haverford paramedics in Pennsylvania. He is a residency-trained, board-certified emergency medicine physician who is a Fellow of the American College of Emergency Physicians. Dr. Dickinson began his career in emergency services in 1979 as a firefighter-EMT in upstate New York. He has remained active in fire service and EMS for the past 25 years. He frequently rides with EMS units and has maintained his certification as a National Registry EMT-Paramedic. He has served as medical editor for numerous Brady EMT-B and First Responder texts and is the author of Fire Service Emergency Care, and co-author of Emergency Care, Fire Service Edition, and Emergency Incident Rehabilitation. He is co-editor of ALS Case Studies in Emergency Care.